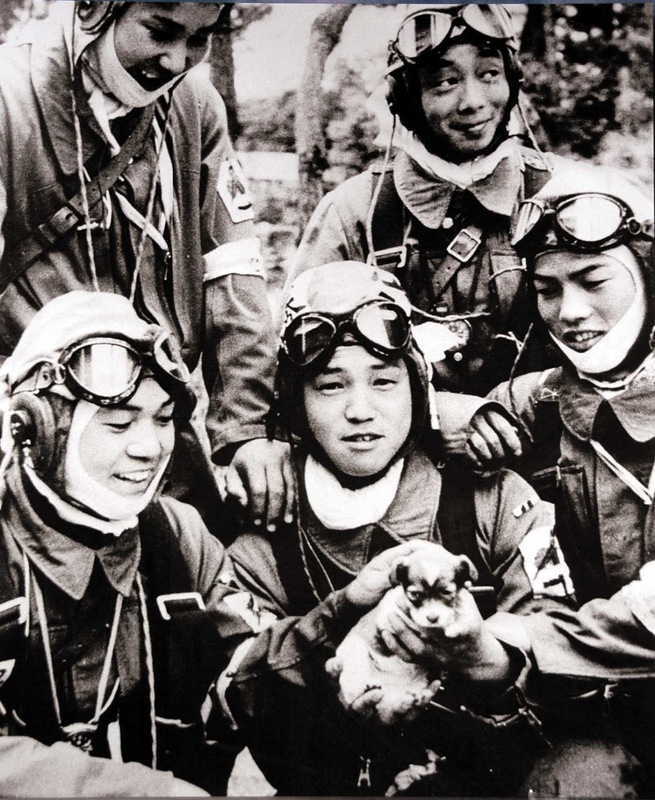 Photo shows Corporal Yukio Araki (age 17 years old) holding a puppy with four other young men (age 18 and 19 years old) of the 72nd Shinbu Corps. An Asahi Shimbun cameraman took this photo on the day before the departure of the 72nd Shinbu Corps from Bansei Air Base for their kamikaze mission in Okinawa. Yukio Araki became the youngest kamikaze pilot during the Second World War when, at the age of seventeen, he took off from the Bansei Airfield, Kagoshima in a Tachikawa Ki-54 twin-engine training aircraft on 27 May 1945. It has been speculated that his plane was one of two that struck the destroyer USS Braine (DD-630), killing 66 of its crew; however, the ship did not sink. Araki had been home in April 1945, and left letters for his family, to be opened upon the news of his death. The letter to his parents noted: “Please find pleasure in your desire for my loyalty to the Emperor and devotion to parents. I have no regrets. I just go forward on my path”. Ceremonies were carried out before kamikaze pilots departed on their final mission. The Kamikaze shared ceremonial cups of sake or water known as “mizu no sakazuki”. Many Army officer Kamikaze took their swords with them, while the Navy pilots (as a general rule) did not carry swords in their planes. The kamikaze, like all Japanese aviators flying over unfriendly territory, were issued (or purchased, if they were officers) a Nambu pistol with which to end their lives if they risked being captured. Like all Army and Navy servicemen, the Kamikaze would wear their senninbari, a “belt of a thousand stitches” given to them by their mothers. They also composed and read a death poem, a tradition stemming from the samurai, who did it before committing seppuku. Pilots carried prayers from their families and were given military decorations. The Kamikaze were escorted by other pilots whose function was to protect the Kamikaze to their destination and report on the results. According to a U.S Air Force, approximately 2,800 Kamikaze attackers sank 34 Navy ships, damaged 368 others, killed 4,900 sailors, and wounded over 4,800. Despite radar detection and cuing, airborne interception, attrition, and massive anti-aircraft barrages, 14 percent of Kamikazes survived to score a hit on a ship; nearly 8.5 percent of all ships hit by Kamikazes sank. Love the suit, this is my own personal view, I wish his scruff was not as scruffy, I would love to see him clean shaven again. Other than that one little thing, again my opinion only he looks fatitsanc as does David.